A report by IndiaMART.com, one of India’s largest online B2B marketplaces, has found that the SME-dominated automotive sector is among the top three sectors on the site in terms of the number of buyers it attracted from other countries, both developed and developing. The report, The Automotive Components Sector, reveals that the US emerged as one of the leading countries in terms of the number of its buyers visiting IndiaMART.com’s automotive category for their sourcing requirements — 12.8 per cent of its total buyers did so. Over one million SMEs from sectors such as auto components, apparel and fashion accessories, engineering and industrial, home decor, and others are registered with IndiaMART.com, which acts as a B2B matchmaking platform for these suppliers and helps them generate leads from over five million buyers from across the globe. Asian countries are also key buyers for auto products from India. The portal’s automotive category had visits from buyers based in Pakistan (8.2 per cent), China (7.6 per cent), Malaysia (7.3 per cent) and Bangladesh (7.2 per cent). Buyers from India alone accounted for 28.3 per cent of online visitors for auto parts. The sector also attracted 6.8 per cent of the total buyers from the UK, followed by 6.5 per cent of Canadian buyers, 6.4 per cent of buyers from Germany, and 6.3 per cent of Australian buyers. 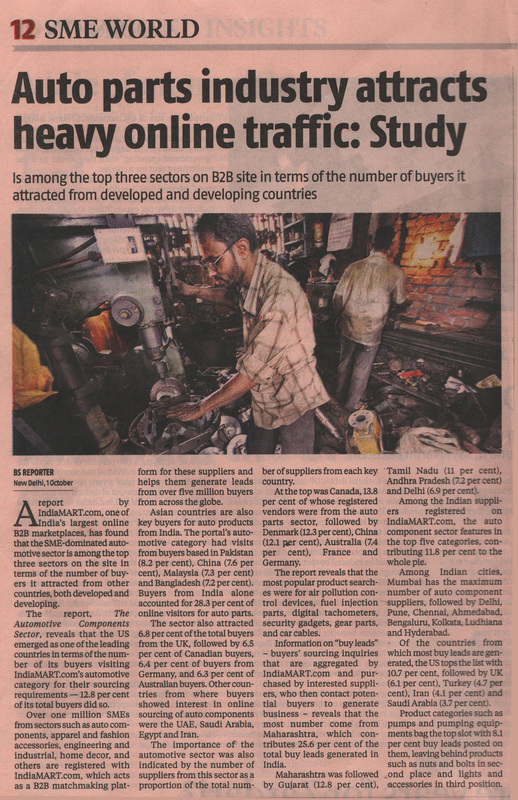 Other countries from where buyers showed interest in online sourcing of auto components were the UAE, Saudi Arabia, Egypt and Iran. The importance of the automotive sector was also indicated by the number of suppliers from this sector as a proportion of the total number of suppliers from each key country. At the top was Canada, 13.8 per cent of whose registered vendors were from the auto parts sector, followed by Denmark (12.3 per cent), China (12.1 per cent), Australia (7.4 per cent), France and Germany. The report reveals that the most popular product searches were for air pollution control devices, fuel injection parts, digital tachometers, security gadgets, gear parts, and car cables. Information on “buy leads” – buyers’ sourcing inquiries that are aggregated by IndiaMART.com and purchased by interested suppliers, who then contact potential buyers to generate business – reveals that the most number come from Maharashtra, which contributes 25.6 per cent of the total buy leads generated in India. Maharashtra was followed by Gujarat (12.8 per cent), Tamil Nadu (11 per cent), Andhra Pradesh (7.2 per cent) and Delhi (6.9 per cent). Among the Indian suppliers registered on IndiaMART.com, the auto component sector features in the top five categories, contributing 11.8 per cent to the whole pie. Among Indian cities, Mumbai has the maximum number of auto component suppliers, followed by Delhi, Pune, Chennai, Ahmedabad, Bengaluru, Kolkata, Ludhiana and Hyderabad. Of the countries from which most buy leads are generated, the US tops the list with 10.7 per cent, followed by UK (6.1 per cent), Turkey (4.7 per cent), Iran (4.1 per cent) and Saudi Arabia (3.7 per cent). Product categories such as pumps and pumping equipments bag the top slot with 8.1 per cent buy leads posted on them, leaving behind products such as nuts and bolts in second place and lights and accessories in third position.